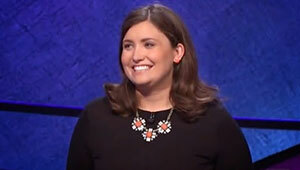 Wellesley alumna Julia Collins ’05 has ended a phenomenal run on Jeopardy!, which the syndicated television game show has just aired. Collins, a business consultant who majored in art history and history, won 20 consecutive games, making her the all-time best woman player of the game in the show’s 30 year history, and the overall leader second only to Ken Jennings, who won 74 games in 2004. She also ended her run with $428,100 in prize money and the chance to come back to the show for a “tournament of champions” later in the year. As noted on MSNBC, Collins attributes her success on the show to her encyclopedic memory and her multidisciplinary education. “I feel like it’s really important for girls to see other women who are being celebrated for being smart. And to see accomplishments that are related to intelligence,” Collins has said.